Sevris handed the bronze telescope to his decnar, Joah, who twisted the cylinders, adjusting the focus so he could watch the Breakwall docks on the far side of the river. At least a hundred men, women, and children formed a line – a surprisingly well-mannered line – from the town to the main pier. Each one loaded crates or sacks or chests onto a waiting merchant ship, already sitting low in the water from excess weight. Four boats had already been filled to the brim and set off down river, to a destination Sevris could only guess at. Another five ships waited in line behind the current one. A few he even recognized from the regular stops they made here. “Can you tell what they’re taking?” Sevris asked. He and Joah stood at the top of Barrow Rise, a tall, tree-covered hill on the west side of the Vitrix River. He kept men here daily, as it provided the best vantage point over Breakwall. Sevris took the telescope and looked again, squeezing the focus as tight as he could on one of the men carrying a small chest. He recognized it as an old Anduain treasure box kept by Lord Morgantin. An oak chest, with carvings of birds on the side and a wide tree on the front. It sat on a thin table pushed up against the wall of Lord Morgantin’s chambers, and it held a collection of pocket watches the lord had collected from far away cities. He looked away, tired of watching an army of refugees looting every last scrap of worth from Breakwall Castle. He understood his men’s zeal for combat. They wanted to fight for their home, and consign these thieves to the justice they so richly deserved. But they were horribly outnumbered, they would be fighting against some of their own kin, and any attack they ventured would either fail, or turn them into wanted men throughout the kingdom, instead of just Breakwall. So instead they sat here, trapped in the woods on the wrong side of the river, watching helplessly as their home was ransacked. Joah turned back to the river. He said nothing, but there was no mistaking the disappointment on his decnar’s face. Footsteps crunched on the ground behind them. Sevris turned to see two of his soldiers, Orik and Pait, approaching through the forest’s underbrush. Sevris turned to Joah, who raised an eyebrow. Sevris nodded. He hadn’t expected to see Gunnar again. At least not alive. If the crafty old sentinel had managed to survive the chaos of the last few weeks, then he could prove useful to Sevris’s band of outlaws. He tossed the telescope to Orik, who caught it easily, then motioned to Joah. A bundle of thick vines covered the narrow cave entrance leading to their hideout, making it hard to spot if you weren’t looking for it, especially in the darkness under the forest canopy. Sevris pushed the vines out of the way and slid sideways into the opening, which wasn’t much more than a large crack in the side of the hill. A short, jagged tunnel edged downward, eventually depositing him and Joah into a small room with carved walls and a broken stone slab lying on the floor. He walked through an opening on the far side and into the passageway leading to his new home these days, a place he feared was all too fitting for him. Barrow Rise got its name from a series of catacombs built beneath it called Eldritch Barrow. It was carved out by Anduains long ago, in the centuries before the Thandarans even had this island on their maps. The Barrow’s crypts had been looted and desecrated by those same Thandarans, leaving it nothing more than a collection of moss and vine-covered passageways, with depressions in the walls where bodies had once been interred. Stories were told to this day of the ghosts and spirits that wandered the tunnels of the Barrow, seeking vengeance for the disturbance. Not that Sevris paid them any mind. Unfortunately, some of his men did, which made for some harsh convincing when Sevris decided to make the Barrow their new home. Sevris and Joah walked through the darkened passage, heading for the faint light at the end of the hall. He turned the corner, finding a modestly sized room filled with blankets, packs, armor, and food, along with two dozen of his men, each looking somewhat haggard and dirty. Sitting at the side, in stark contrast to the dirt-covered soldiers, was a young girl with gleaming blond hair, wearing the brown Resurrectionist robes of a war priest, along with white-haired old Gunnar, his lord’s sentinel, sporting his typical gray robes. The priest turned and smiled at the sight of a familiar face. “Sober,” Joah whispered from behind. Sevris furrowed his brow. He thought to argue, but the serious look on the sentinel’s face warned him otherwise. He sighed and then motioned Gunnar and the girl to follow him around the corner. “Speak,” he said, once they were alone. “The dock master’s daughter,” he said to the girl, who blushed. “Centnar.” She bowed her head. Sevris felt the hairs on his neck stand up. Was this some new Anduain magic he hadn’t heard of? “Tell him about the dream,” Gunnar said, nudging her shoulder. Sevris frowned. He appreciated that Gunnar had come to him, but his explanation could be the product of ale, and Alayna could just be an excitable young girl. Instinct took over and Sevris shot Gunnar a look before softening his glare. He had to remind himself that she was the enemy now. Sevris pursed his lips. He knew what Gunnar was getting at, and he was almost inclined to agree with him the more he thought about it. “A directive from the Lady,” he offered. Gunnar pressed a finger into Sevris’ chest, and the centnar raised an eyebrow at the intrusion. Sevris nodded. 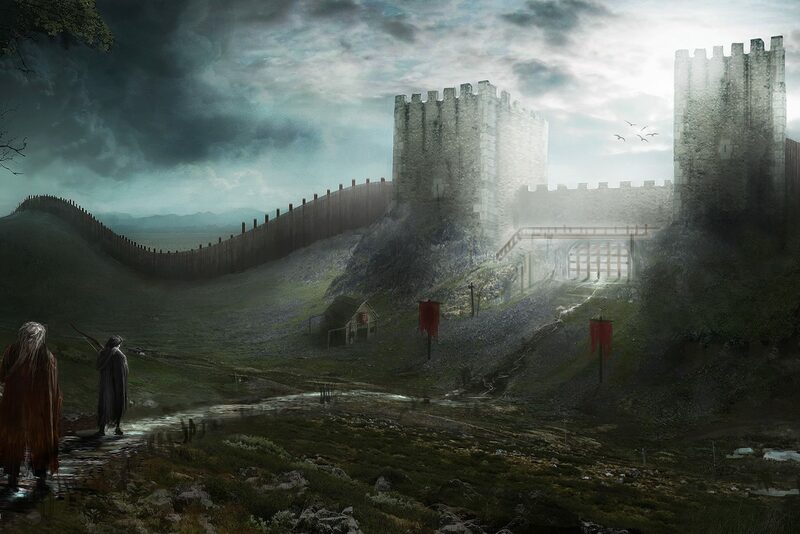 There were two secret entrances to the keep, one from a drainage gulley leading out from the kitchens and another from an underground tunnel that started in a rarely used storeroom and ended in the basement of a small millhouse on the outskirts of the castle. Only half a dozen people knew about either entrance, and all of them were dead now. Except for Sevris and Gunnar. Sevris nodded to himself as the plan formed in his head. Suddenly, he could act against his enemy, without worrying about his numbers disadvantage. “Then we sneak her out and get her to Corendar as fast as possible,” Gunnar finished for him. Sevris looked away, letting the plan form in his mind. He could finally do something about this tragedy, something that wouldn’t see his men and their families destroyed by open warfare. He turned to Gunnar and nodded, allowing himself a quick smile before returning to the main room. The soldiers under his command all looked over, curious as to what news he might have. Chapter 6 coming next week! Want more Cithria? Check out the Rise of Cithria series on amazon! Get started with the first book for FREE!